Date: December 16,2008. Place: Old Bus stand premises at Ramanagaram. Time: 2 p.m. Sitting M.L.A of the constituency and former chief minister H.D.Kumara Swamy's 49th birthday was celebrated by his fans and J.D.S party workers, in his absence. As the former chief minister was busy campaigning for his wife Anitha Kumaraswamy in Madhugiri Constituency on December 16th he was unable to participate in the celebration. However, the J.D.S. 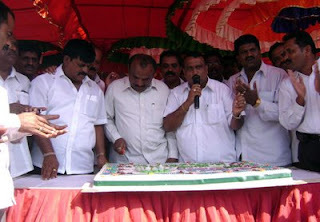 party district chief Mr.K.Raju cut the cake, while the taluk J.D.S. working president Mr.Rajashekar sang the birthday song. Many leaders and party workers present on the occassion lend their voice and sang 'happy birthday Kumaranna'! As usual the cake was distributed err.... snatched away by the ........?